It was a fun day with a fun group! 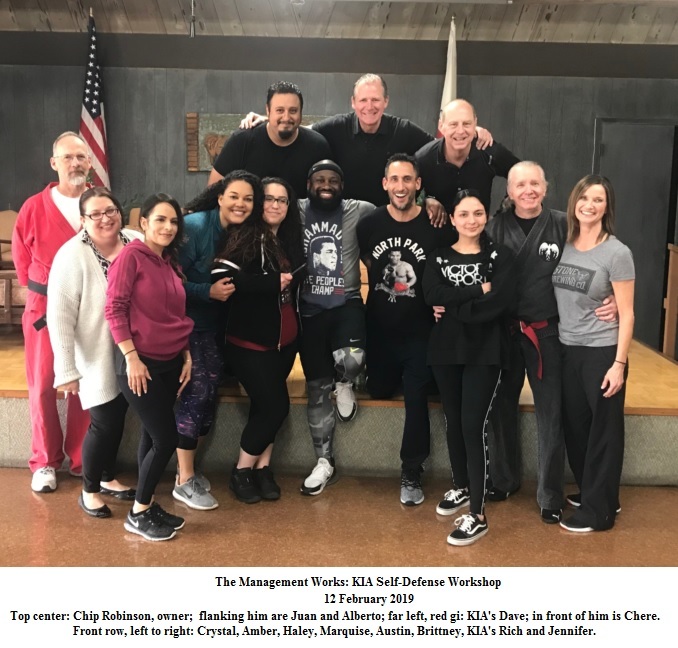 Chip Robinson, owner of The Management Works and a Karate Institute of America fighting and forms champion, hosted a self-defense workshop for his employees on 12 February 2019. 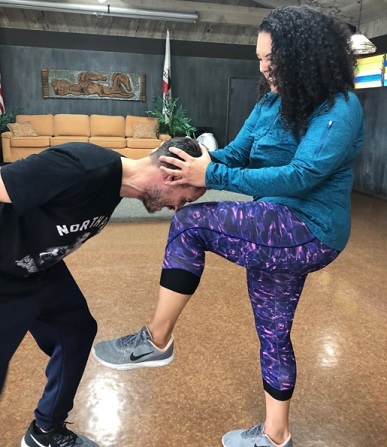 The following photo was taken at the end of a four hour, jam-packed session of self-defense knowledge, kicks, strikes, techniques, tactics and strategies. Chip, aka Hawk (his KIA callsign), has surrounded himself with a host of excellent and professional individuals who have all contributed to the success of The Management Works - a real estate property management company located in Newport Beach, CA. Using a simple pen and a back kick, Jennifer destroys her boss! What a time to get even, eh? We call this the “Crystal Claw!” Ouch! Poor Marquise, but such a great sport! This is the “Stick & Stab” box training portion of the workshop. Very attentive students! Haley practices her pen sticking technique on Dave “Rugman” Sampson, the 42nd Black Belt of the Kiado-Ryu, owner of MH Custom Carpets in Laguna Hills, CA, and always a devoted teacher. Thanks, Rugman! And how uncomfortable is this? Amber slams a knee into Austin’s face. BIG OUCH! DOUBLE OUCH! A very painful “private” moment as Brittney delivers a snap kick to Juan’s, well, you get the picture! Jennifer having too much fun at Alberto’s displeasure! Stick that pen right in that throat, and then laugh about it! How fun it is to be victorious in self-defense! A BIG SHOUT OUT goes to Chip, Juan, Alberto, Marquise, Austin and Dave for being such great sports in playing the role of attacker. Their selflessness helped the ladies in developing even more confidence than they have naturally. Needless to say, this workshop at The Management Works was a fun and memorable event! Thanks Chip and all those who participated. 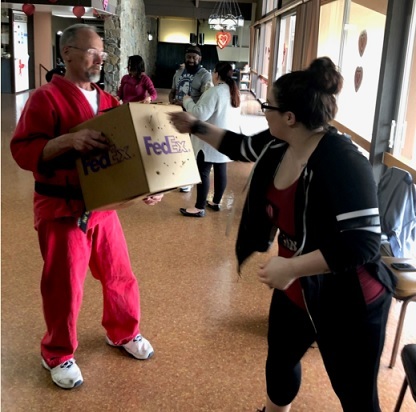 We appreciate the opportunity of sharing self-defense knowledge with others and hope to see you again for round #2!